Greece is out of money, and its current government and economic policies are not supportive of a lasting solution. All the money it's borrowed has been wasted, flushed down the statist drain, in order to support Greece and its citizens in a style they can't afford. What's happening now is like musical chairs: when the Greek music stops (coming soon), someone (e.g., the EU, ECB and IMF) is going to have to record the loss on their balance sheet. The question is not whether Greece will default, but how it will do it and who will pay the eventual price. Meanwhile, despite the strong likelihood that Greece will not find a lasting solution in the coming days, financial markets are not displaying any signs of distress. To be sure, there is lots of worry out there, but markets are still quite liquid and functioning normally. This makes sense, because a Greek default is not an earth-shattering event that comes out of the blue. It's been a long time coming, and Greece is a very small cog in the global financial markets. The chart above shows 2-yr swap spreads in the U.S. and Eurozone. 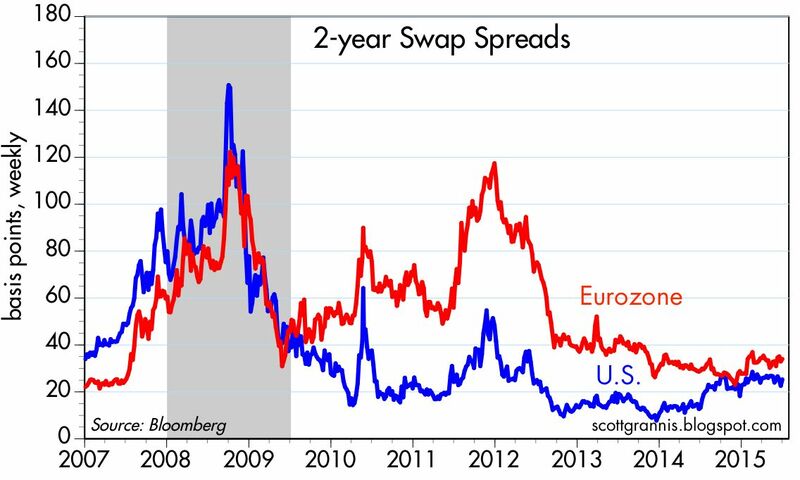 At current levels, swap spreads are well with the zone of normality. As such, they are saying that financial markets are liquid, and systemic risk is low. If a Greek default were a serious threat the stability of the Eurozone financial system and economy, swap spreads would be much higher—like they were when the PIIGS crisis reached a peak in late 2011. 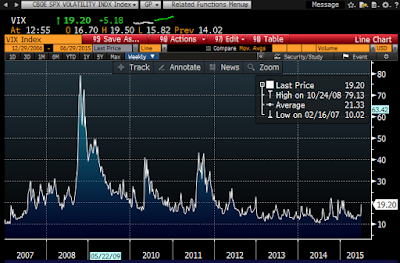 The chart above shows the Vix index, a barometer of the market's level of fear, uncertainty and doubt. It's jumped up from 12 to almost 20 in the past six days, and that's telling us that markets are worried that something might go wrong. 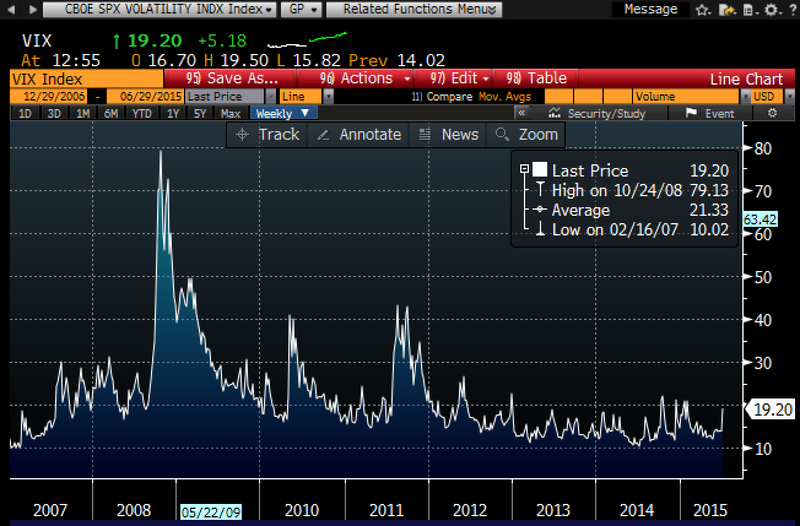 But if this were a really serious worry, the Vix would be a lot higher than it is today. Putting the two together, it's obvious that markets are nervous, but it's comforting that there is virtually no sign that an unpleasant resolution to the Greek crisis presents any threat to financial markets or even the Eurozone economy. If anything, a painful resolution to the Greek crisis would be a reminder to other countries that unproductive economies with bloated and inefficient governments are unsustainable and ultimately very painful for everyone. The best solution for Greece would be to grow its way out of debt, by reducing the size of its government and adopting pro-growth economic policies. UPDATE: I refer you to a good post of mine from several years ago: "Greek Myths." It discusses in more detail why a Greek default and/or a Grexit do not spell doom for either Greece or the Eurozone. 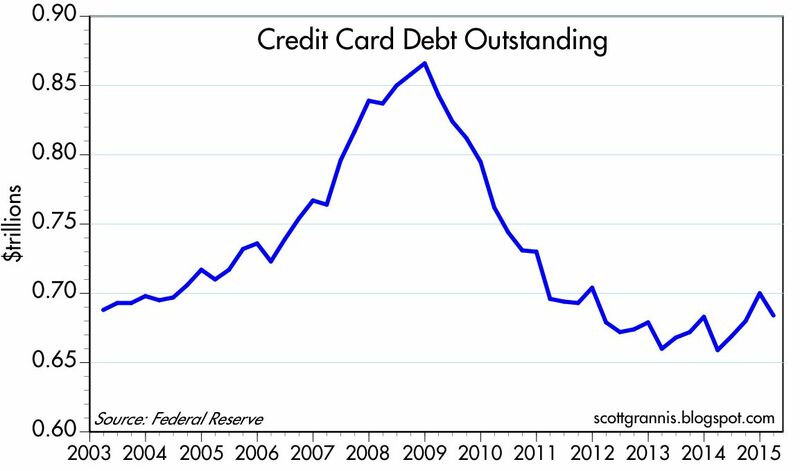 The 2008 financial crisis and deep recession taught consumers that having a lot of credit card debt was not a smart thing to do. 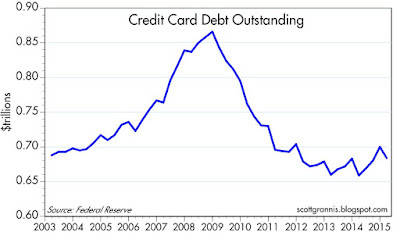 Credit card debt outstanding now is about the same as it was 12 years ago, despite the fact that personal incomes have increased over 60% since 2003. 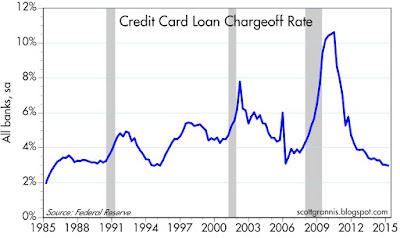 As a percent of personal income, credit card debt was 7.4% in 2003, and it fell continuously to a low of 4.5% today. 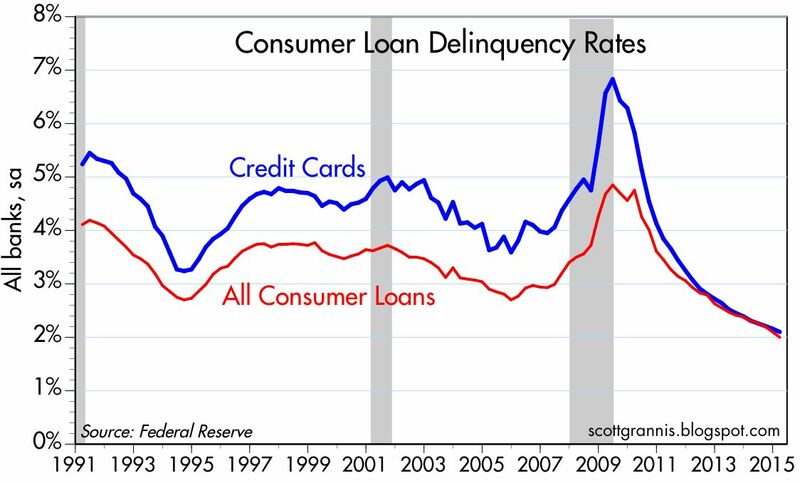 By eschewing credit card debt, consumers have become much less likely to be delinquent on their credit card debt payments. 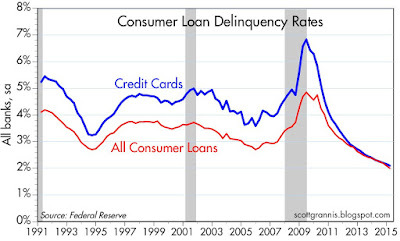 Delinquency rates are as low as they have ever been since data was first collected in 1991. With lower delinquency rates, it is not surprising that credit card companies wrote off only 3% of their outstanding loan balances in the first quarter of this year. That was the lowest chargeoff rate since 1985. Today's consumer is a lot smarter, and a lot more careful with taking on debt. This reinforces the theme that I've been emphasizing for years: the Great Recession was so traumatic that its memory still lingers, making this the most risk-averse recovery in modern history. Risk aversion has been one of the hallmarks of this recovery, and that is one of the reasons why the recovery has been so tepid. It is also a good reason not to fear another recession: optimism is in short supply. The time to be worried is when everyone is optimistic and taking on lots of risk. 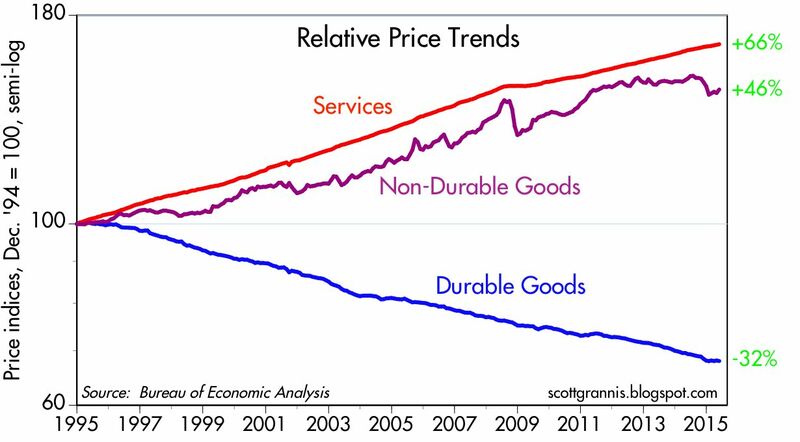 The data for this chart comes from the BEA's calculation of the price deflators for Services, Non-durable, and Durable Goods. Prior to 1995 there were times when some prices grew more or less than others, but post-1995 is the first time since the Depression that the prices of some things fell continuously while others rose. The likely culprit for two decades of persistent deflation in the durable goods sector? China comes to mind, along with huge leaps in technological progress. In the process of industrializing and modernizing its economy, China figured out how to make things much cheaper than anyone else in the world by using Western capital and technology to greatly enhance the productivity of hundreds of millions of its workers that were formerly vastly underutilized. Is this a bad thing? Well, let's think about it. Consider this quick and dirty analysis: The deflator for Services is a decent proxy for real wages, since the service sector of the economy is far larger than the manufacturing sector and the major component of services is labor. As proof, I note that real personal income over the same period as the chart rose by 73%, only slightly more than the 66% rose in the prices of services. 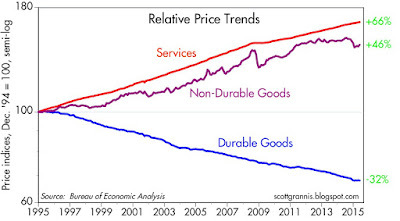 Now compare the 66% rise in the price of services to the 32% decline in the price of durable goods. That huge and "unequal" gap means that a unit of work today for the average person buys him or her 2.44 times as much in the way of durable goods as it did in 1995. Put another way, the prices of durable goods on average have declined some 60% relative to incomes. While grossly "unfair" to US businesses individuals engaged in the manufacture of durable goods, this huge, unequal and growing gap in prices has been the biggest boon in history to nearly everyone else. Thanks to this rising inequality, just about everyone you see on the streets today carries a smartphone, a device capable of feats that were unimaginable two decades ago, and which can be bought for about two week's worth of work at the prevailing minimum wage. Meanwhile, thanks to its export earnings, China today is importing roughly 15 times as much from the US as it did two decades ago. Inequality of wealth and prices is everywhere these days, and thank goodness. Andy Kessler in today's WSJ reminds us that great inequalities of wealth almost necessarily spring from great advances in technology, manufacturing, services and general productivity. A company’s profits are the minimum value of the work it does for you and for society. Google, to take another example, generates huge profits. CEO Larry Page has an estimated net worth of $30 billion. But Google offers you a valuable service, and society benefits to the tune of trillions, yes trillions, of dollars in commerce that happens thanks to Google searches, mail and maps. Similarly, an iPhone 6 is worth a heck of a lot more than $600; you can hail a car, trade stocks, call your mom, all without being chained to a desk. Everyone should stop focusing on an entrepreneur’s wealth and instead focus on the value the customers gained from his products. I can’t dig for oil, let alone frack, but I am happy to pay Exxon a premium for my high-test gas. Collectively, we are richer because of Exxon. So inequality is not a bug of capitalism; it’s a feature. It's no secret that the Fed will begin raising short-term interest rates before too long. However, the method they will use has never been tried before, so there naturally exists a degree of confusion and uncertainty surrounding the future course of monetary policy and how it will affect the economy. The purpose of this post is to simplify the issue in the hope that leads to better understanding. 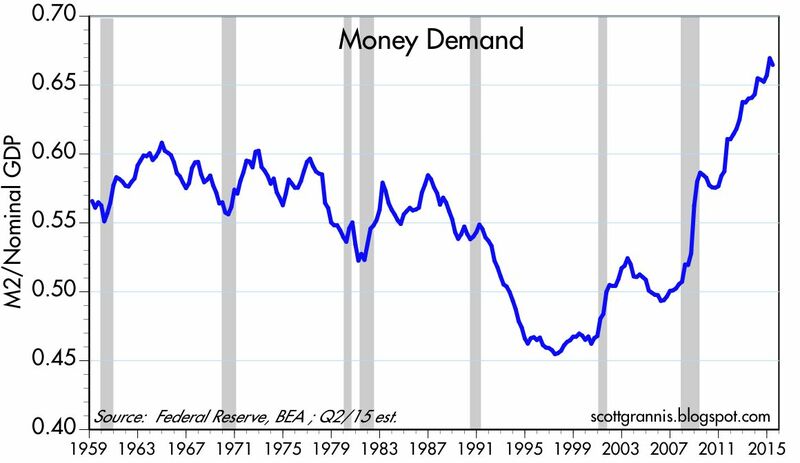 As I've argued in numerous posts over the past 5-6 years, the most important driver of monetary policy from late 2008 until recently has been unusually strong money demand. As I see it, the Fed was almost compelled to resort to Quantitative Easing in order to satisfy the world's demand for money and near-money substitutes. 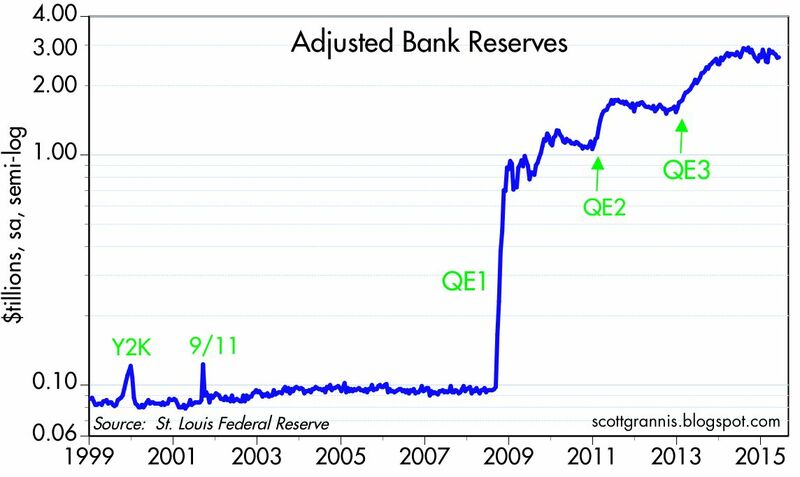 QE was not about pumping money into the economy, it was all about satisfying the economy's demand for liquidity. QE was erroneously billed as "stimulative," since printing money in excess of what's needed only stimulates inflation. Instead, QE was designed to accommodate intense demand for money, without which the economy might well have stumbled. It all started when financial markets teetered on the edge of the abyss in the third quarter of 2008. The problem was that the world suddenly wanted a lot more money and money substitutes (e.g., cash, bank savings deposits, T-bills) than were available. Debt that made sense when housing prices were rising suddenly became suspect as prices collapsed. Too many people tried to rush for the exits, but the financial system lacked the necessary liquidity to allow so many to sell so much. Even before the meltdown that followed the collapse of Lehman, demand for T-bills was so intense that the Fed all but exhausted its holdings of T-bills by mid-2008 in an attempt to increase their supply on the market. Such was the shortage of money in late 2008 that the dollar soared, commodity prices collapsed, and the prices of TIPS and Treasuries signaled impending deflation on a massive scale, as the charts above show. The increase in the demand for money can also be seen in the chart above, which measures the ratio of M2 (cash, demand deposits, retail savings accounts) to nominal GDP. Think of it as the amount of cash and cash equivalents that the average person wants to hold relative to his annual income. Between the end of 2007 and today, that ratio has jumped by over 30%. It's as if collectively we wanted to stuff almost $3 trillion under the mattress for a rainy day. The shock of the 2008 financial collapse and the deep recession that accompanied it resulted in years of risk aversion. The most important policy change that QE brought with it was the Fed's decision to pay interest on bank reserves (IOR). Prior to that, bank reserves paid no interest, but banks were compelled to own them in order to collateralize their deposit base (our fractional reserve banking system required banks to hold about $1 in reservers for every $10 in deposits). This meant that reserves were a deadweight asset, so banks always tried to minimize their holdings of reserves. With QE, the Fed had to encourage banks to hold reserves, and IOR was the key to doing that. Controlling and limiting the supply of reserves was the Fed's primary policy tool prior to QE. The Federal Open Market Committee controlled the supply of reserves indirectly, by targeting the interest rate that banks paid each other to borrow or lend the relatively fixed supply of reserves in existence. If the interest rate on the Fed funds market slipped below the FOMC's target, then the FOMC would deduce that reserves were in over-supply, and they would sell bonds in order to reduce the supply of reserves. If the Fed funds rate exceeded the FOMC's target, they would buy bonds in order to alleviate the shortage of reserves. (The Fed can only buy bonds from participating banks, and it can only pay for them by crediting the banks' reserve account at the Fed.) If the Fed wanted to ease monetary conditions, it would lower the funds rate target, and sell bonds to add reserves in order to make reserves more plentiful. By targeting the Fed funds rate and indirectly the supply of bank reserves, the Fed was thereby able to control the money supply and in turn inflation. But paying interest on reserves changed everything. Suddenly banks viewed reserves as functionally equivalent to T-bills: a very safe, short-term, very liquid, and interest-bearing asset. If the world wanted tons of safe "money," the Fed now had the means to deliver what the world wanted. With QE, the Fed effectively transmogrified trillions of notes and bonds into T-bill equivalents. IOR allowed the Fed to create virtually unlimited supplies of the "money" that the world so desperately wanted—without being inflationary. Inflation, as Milton Friedman taught us, only happens when the supply of money exceeds the demand for it. QE was not about artificially pumping up the supply of money, it was about providing the money that the world wanted. Banks have taken in almost $4 trillion of savings deposits since late 2008, and instead of lending all that money to the private sector, they lent most of it to the Fed, receiving bank reserves in exchange. (In practice, banks used their deposit inflows to purchase notes and bonds which they then sold to the Fed, which the Fed paid for with bank reserves.) 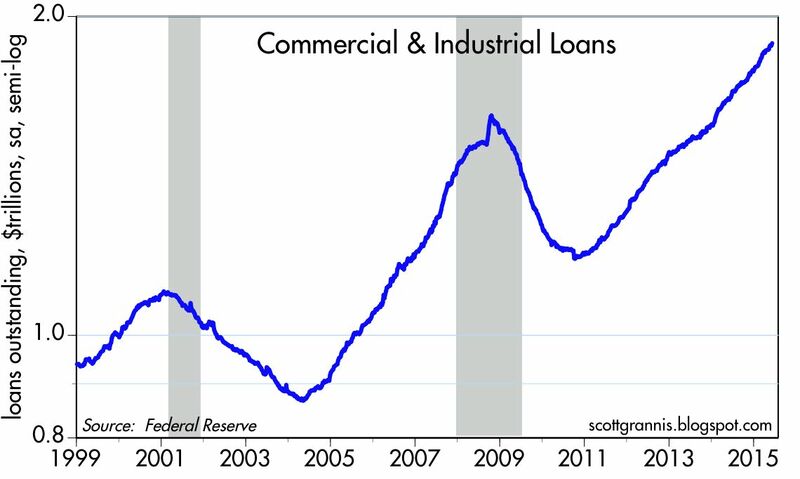 Banks were very reluctant to lend to the private sector, but they loved lending to the Fed, since that involved zero risk. Today we know that all of the above is true, because the Fed has purchased some $3 trillion of notes and bonds yet inflation has remained relatively low and stable. The Fed supplied just enough money to satisfy the world's demand for money, so it wasn't inflationary. So now we look ahead to the unwinding of all this. Since a huge demand for money is what led to QE, the reversal of QE will (or at least should) be led by a reduction in the world's demand for money. If and when the banking system's desire to hold trillions of excess reserves declines, the Fed is going to have to reduce the supply of reserves—by selling its holdings of Treasuries and MBS, or allowing them to mature—and/or take steps to increase banks' desire to hold those reserves—by raising the interest rate it pays on reserves. As the Fed has told us, they will almost certainly do both, with an initial emphasis on raising the interest paid on excess reserves (IOER). If they don't, then the supply of money will exceed the demand for it, and higher inflation will ensue. Given that banks currently hold about $2.5 trillion of excess reserves, they have a virtually unlimited ability to increase their lending activities. There's already mounting evidence that banks have returned to the lending business with gusto—which implies that the demand for money is declining and risk aversion is receding. 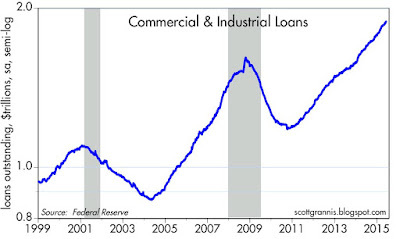 As the chart above shows, bank lending to small and medium-sized businesses has been increasing at strong double-digit rates since early last year. Over the same period, total bank credit has increased by more than $1.1 trillion, and is growing at a 7-8% annual pace. 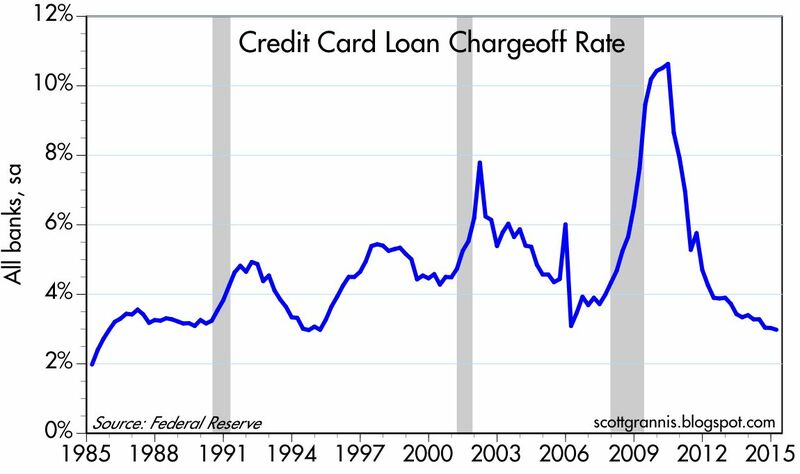 Prior to the beginning of last year, it took almost six years for bank credit to increase by $1 trillion. 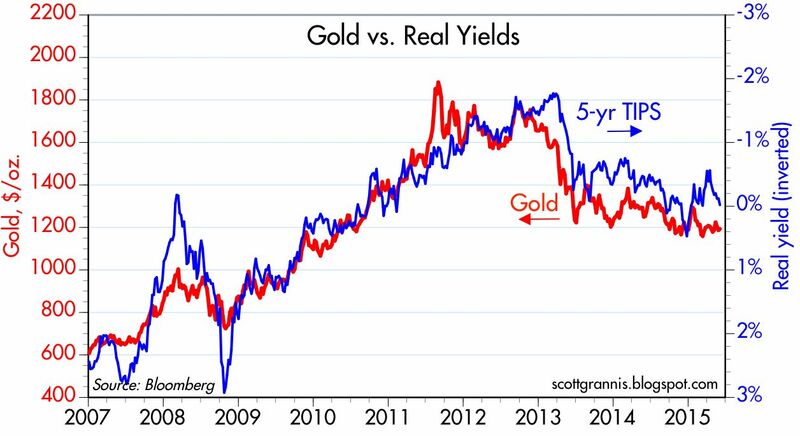 From the end of 2007 to the end of 2013, it was a time of strong money demand and pervasive risk aversion. For the past 18 months, the tide has begun to turn: money demand is down and risk aversion is receding. When banks lend more and the private sector borrows more, that is by definition a decline in the demand for money, and it goes hand in hand with a decline in risk aversion. As banks realize that lending to the private sector produces risk-adjusted returns that exceed the IOER (now a mere 0.25%), their desire to sit on mountains of excess reserves that could be used to collateralize more lending is going to decline and lending is going to accelerate further. Raising IOER makes bank reserves more attractive, offsetting banks' growing lack of interest in sitting on excess reserves. 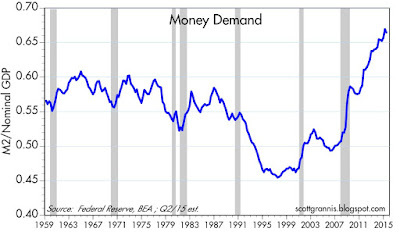 The Fed is going to have to react to the decline in money demand which is already underway, no question. They are going to have to slowly drain reserves from the system, and they are going to have to raise the interest they pay on reserves. But it needn't be scary. 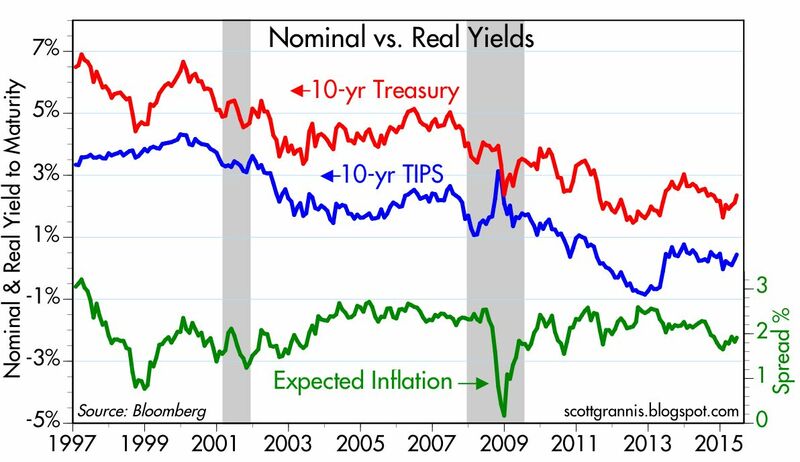 Raising interest rates a few notches at this point is not equivalent to "tightening" monetary policy. It's more like easing off the accelerator, having reached the speed limit. 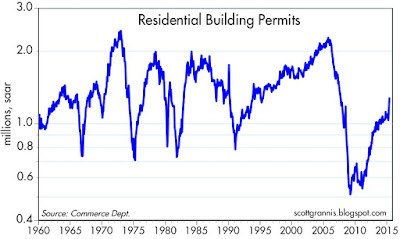 As the chart above suggests, "tightening" monetary policy involves increasing real interest rates. Every recession in the past 50 years has been preceded by a significant rise in real short-term interest rates and a flattening or inversion of the real and nominal yield curves. 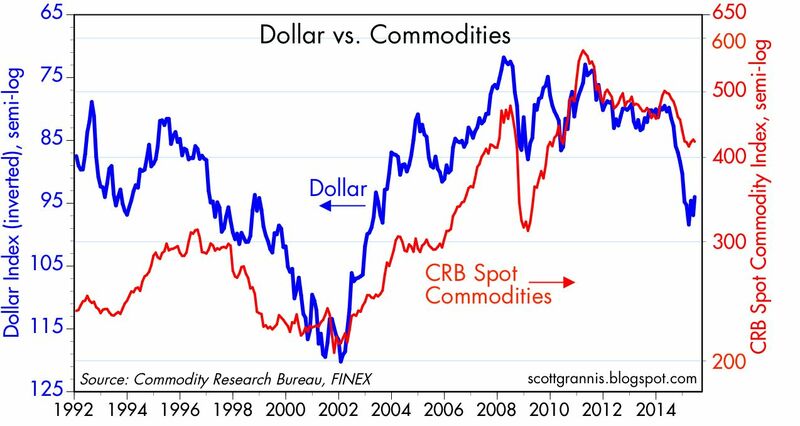 We're still years away from that happening, and real short-term interest rates (the red line in the chart) are still negative. The Fed can raise rates by hundreds of basis points without damaging the economy or threatening the health of financial markets, because higher rates will be a natural response to a stronger economy and a decline in the demand for money. If they don't they risk a potentially painful increase in inflation. In the first quarter of this year, the financial burdens of U.S. households were as low as they have been since the numbers were first tallied in 1980, according to data recently released by the Fed. It's a natural response to the near-death experiences of many individuals during the 2008 financial crisis: most everyone wanted to shore up their finances by saving more and paying down debt. Earlier this month I highlighted the fact that the wealth of U.S. households reached new all-time highs in the first quarter, and that was due in large part to the healing processes that began in the wake of the financial crisis. It's all part of the same story: risk aversion surged in the wake of the financial crisis, and this resulted in a big increase in the demand for money, which in turn shows up in a big reduction in the leverage of the household sector. 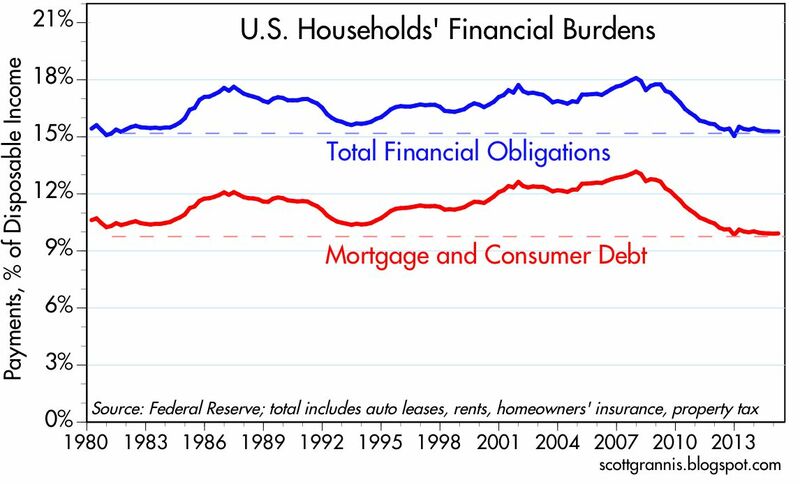 U.S. households' financial burdens (required payments on debt, homeowner's insurance, and property tax as a percent of disposable (after-tax) income) have been a relatively low 15% for the past two years. 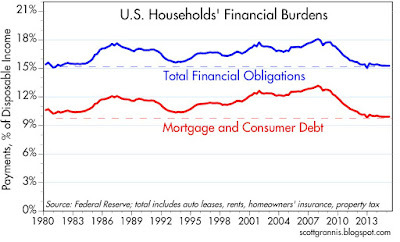 The reduction in debt burdens has come chiefly from reduced debt relative to income, and lower interest rates. 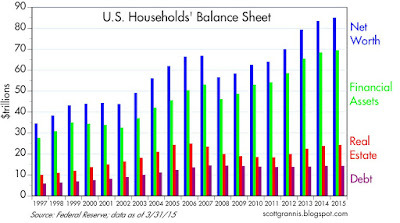 As a result of smaller debt burdens, increased savings and rising equity and home prices, household leverage (total liabilities as a percent of total assets) has dropped by 30%, from a high of 22% in 2009 to the current 15%. 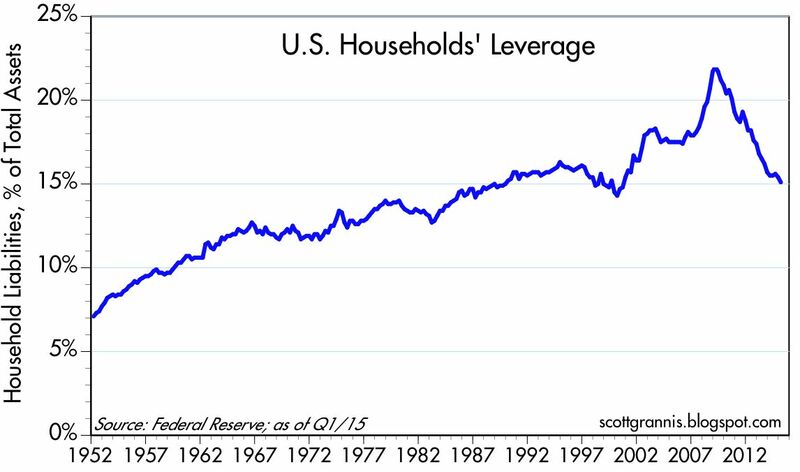 Household leverage today is about the same as it was in 1990. In a sense, we've rolled back some 25 years of debt accumulation. If we have a problem today, it is not "too much debt." On the contrary, the private sector has plenty of capacity to take on more debt. 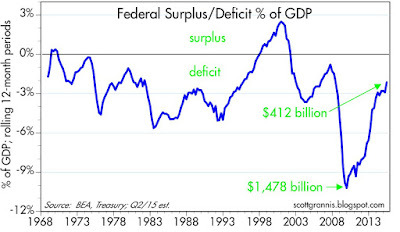 Our public sector, of course, has gobs of the stuff, but at least the deficit has shrunk to a manageable size—for now. 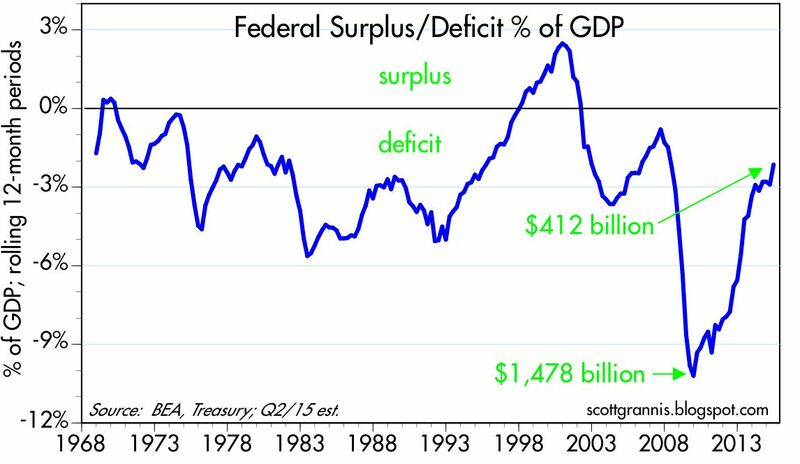 At about 74%, federal debt relative to GDP is large, but not terribly large, and is relatively stable. The U.S. government has borrowed tons of money at historically low interest rates, and has been skewing the maturity of its debt longer for several years now—as any rational borrower would have, in order to "lock in" low rates. If interest rates rise, Treasury will look like a genius, while private sector owners of all that debt will look like fools. 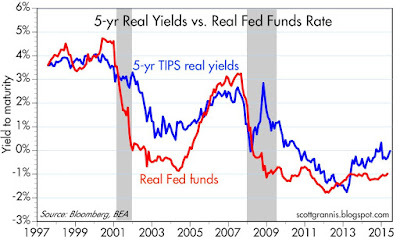 One reason that short-term interest rates are still close to zero (3-mo. T-bill yields are essentially zero as I write this) is that bond fund managers are very much aware of the risk of rising rates, and are hedging their portfolios by stocking up on cash and cash equivalents. (Very low short-term rates are prima facie evidence of very strong demand for short-term securities.) But they can only do so much, since holding zero-yielding cash means giving up lots of extra yield while waiting for interest rates to rise, and the timing of that rise is still very much up in the air. I've been wrong on this for years, but that doesn't deter me from continuing to think that yields are more likely to rise by more than expected, than to fall further. The prevailing inflation meme is that it is dangerously low, and for years central banks have been trying very hard—without much success—to get it to rise. 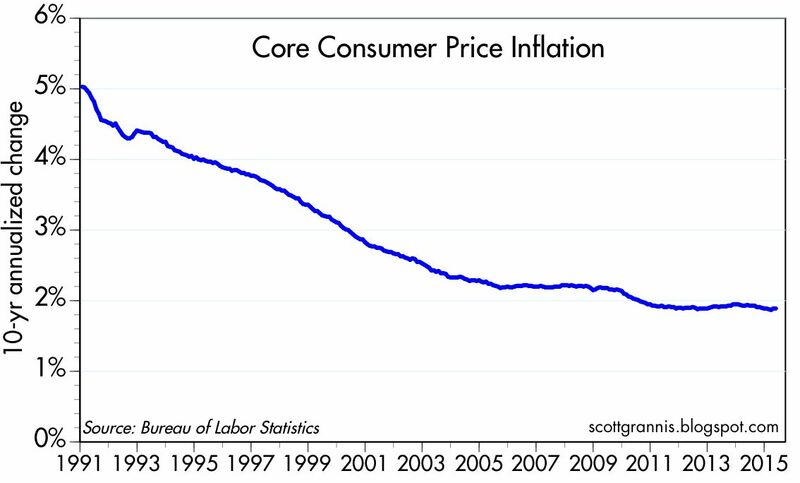 The reality—at least in the U.S.—is that the underlying "core" rate of consumer inflation has been running at close to 2% for over a decade. 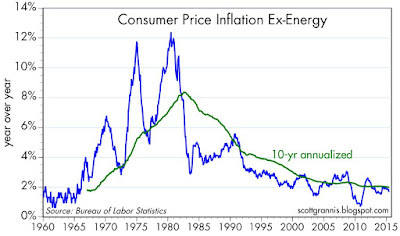 Energy prices have been the principal cause of variations from this trend. 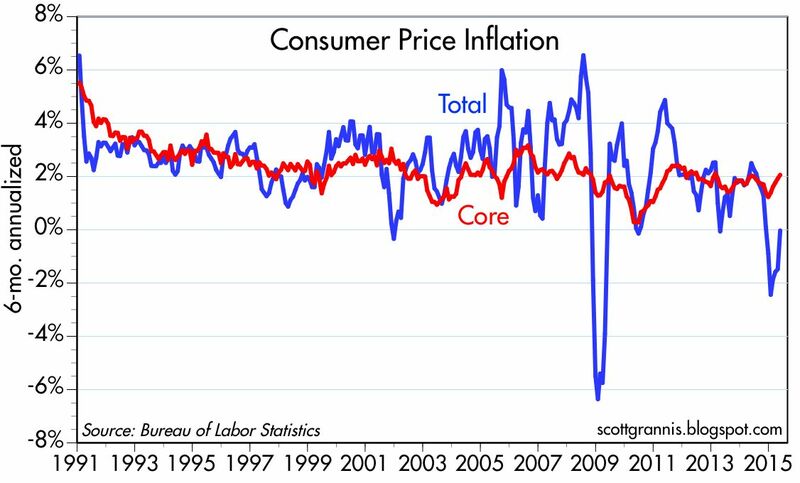 The "core" rate of CPI inflation has been far less volatile than the total rate of CPI inflation. The first of the above two charts show the year over year change in the CPI and the CPI Core indices. The second focuses on the 6-mo. annualized change in these same indices. The total rate of CPI inflation was about zero over the past six months, but it grew at a much more rapid 3.18% (annualized) rate over the past three months. 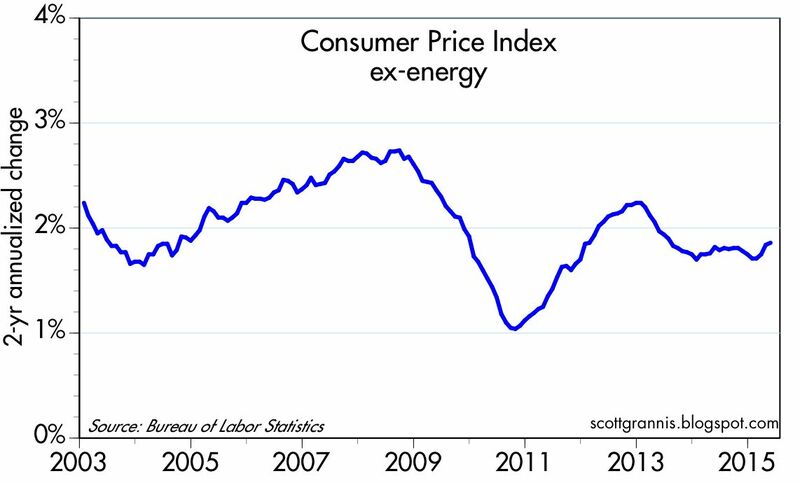 In other words, the overall CPI is quickly "catching up" to the CPI Core and CPI ex-energy rate of inflation, and all are covering at something in the range of 1.8-2.0%. 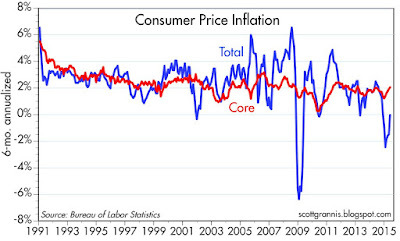 The chart above shows the 10-yr annualized change in the Core CPI. 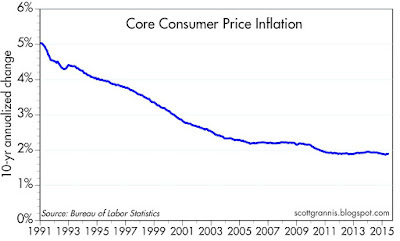 By this measure, the Core CPI has been running very close to 2%, on average, for the past 14 years. 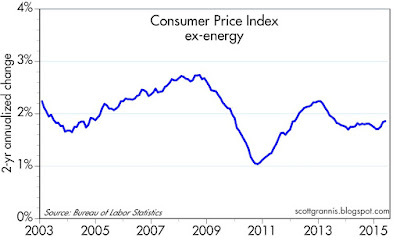 The CPI ex-energy has also been running very close to 2%, on average, for the past 12 years, as the charts above show. 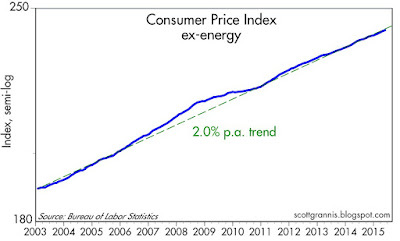 Over the past 10 years, the annualized rate of inflation by this measure has been 1.99%. Over the past year, it was 1.71%. 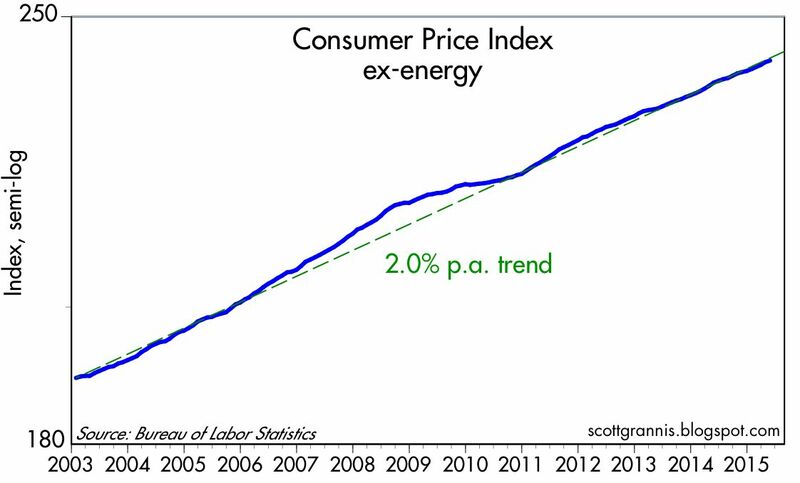 This last chart looks at the long-term trends of the CPI ex-energy. In the past decade it has been relatively low and stable, much as it was in the first half of the 1960s. 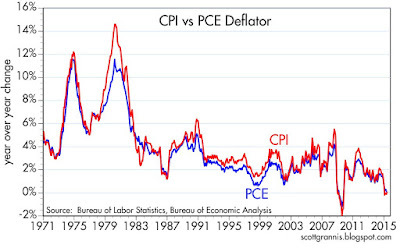 As the chart above shows, inflation as measured by the CPI and the PCE deflator has been almost the same. Over the past 20 and 30 years, inflation according to the CPI has tended to register about 40-50 bps higher per year than the PCE deflator. 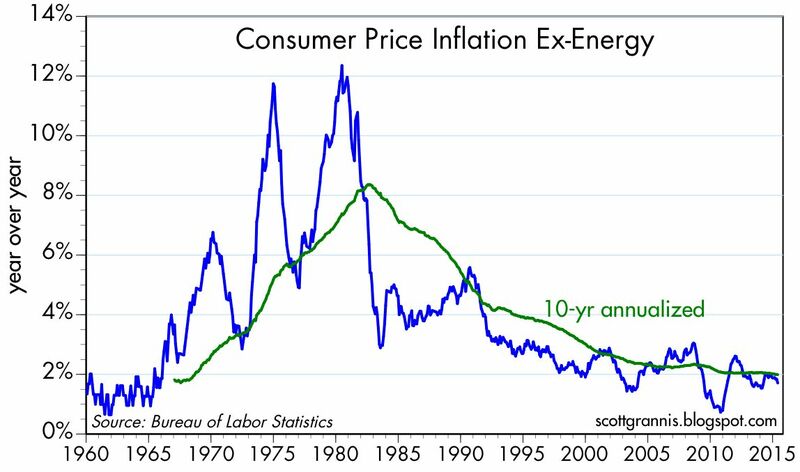 Thus, if the CPI continues to run at just under 2%, the PCE deflator (and its core version) will very likely run about 1.5% per year. There is nothing scary or worrisome about either of those numbers. UPDATE: The bond market is currently priced to this same conclusion: consumer price inflation is very likely to be just under 2% for the foreseeable future. The bond market currently is priced to the expectation that the CPI will average 1.72% over the next 5 years. The prices of 10-yr TIPS and 10-yr Treasuries reveals that the market expects the CPI to average 1.91% over the next 10 years. 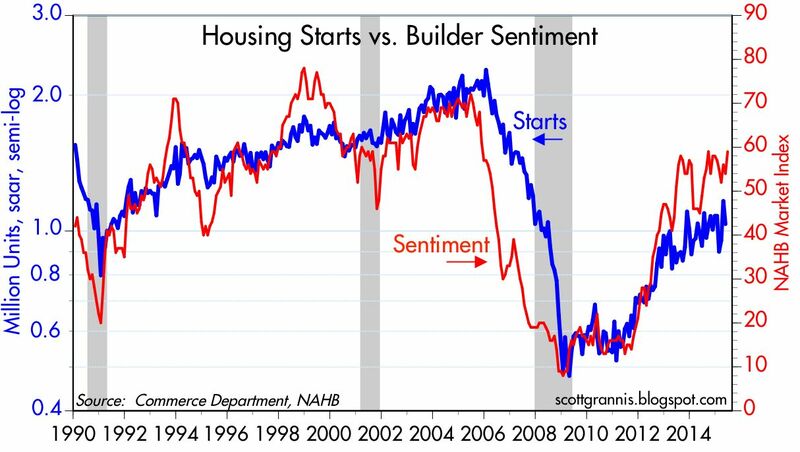 May housing starts were much weaker than expected (1036K vs. 1090K), but building permits were 16% above expectations, and homebuilders' sentiment was comfortably strong. Two positives easily outweigh the starts negative, expecially given the volatile nature of this series. On balance, the housing market is still in good shape and likely to continue improving. 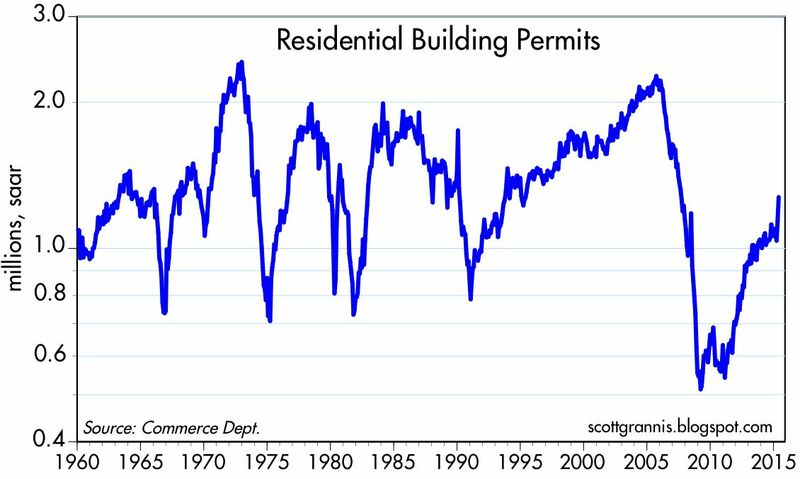 Building permits were very strong, as the chart above shows. Builders are closer to the reality of the housing market than most of us, and today's releases suggest they are expecting conditions to improve. 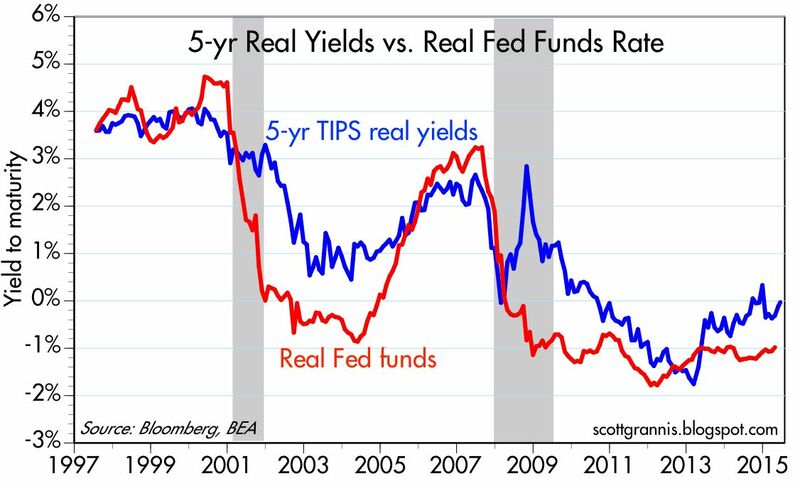 I have yet to see anything which points to a recession or a slowdown serious enough to warrant paying the high price of safety (i.e., cash still yields almost nothing, while yields on competing investments are much higher). Regardless of what you think about the inequality of wealth and incomes, the fact is that the U.S. economy continues to create an astounding amount of wealth—wealth that benefits us all. Household net worth is at record highs, both in nominal, real, and per capita terms, even as household leverage has declined significantly. It's hard to see what's wrong with this picture. According to the Fed, U.S. households' net worth rose $1.63 trillion in the first quarter of this reaching, reaching a new, all-time high of $84.9 trillion. Most of the gains have been in financial assets and savings accounts. 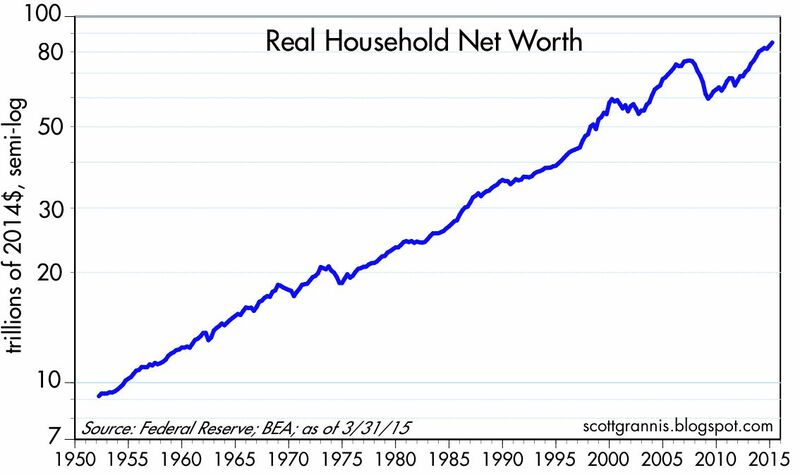 After adjusting for inflation, household net worth also reached a new, all-time high, easily eclipsing the last pre-recession high. After adjusting for inflation and for population growth, real per capita net worth reached a new, all-time high of over $261K. That's 3.3 times as much as it was 50 years ago! 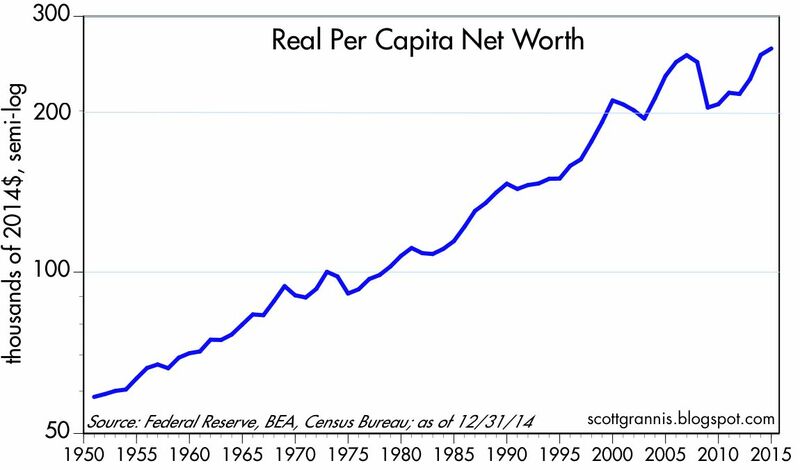 Importantly, the latest surge in wealth was not driven nor sustained by any debt "bubble." 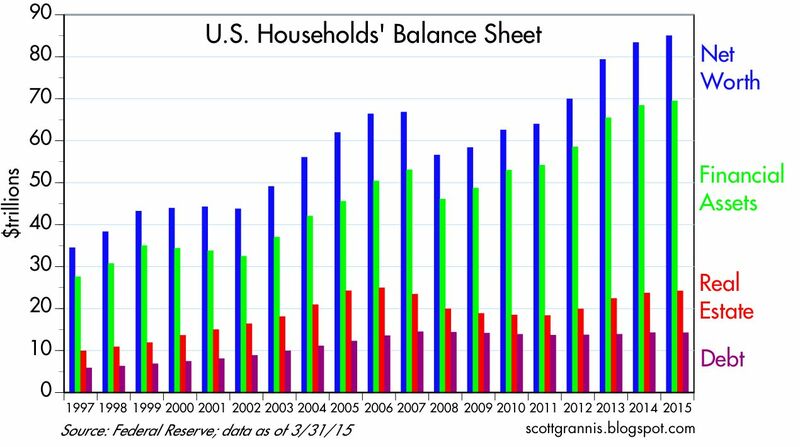 As the chart above shows, household leverage has declined significantly since 2008, all the while net worth rose to new all-time highs. 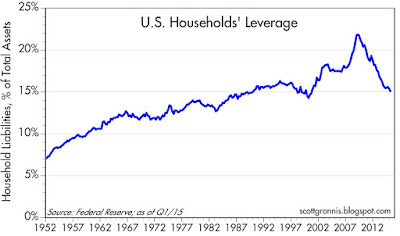 Household leverage today is about the same as it was back in 1990. Even if all this staggering amount of wealth were held by just a handful of people, it would still be the case that we all benefit from it. This wealth is the ultimate source of all jobs and our living standards. Because our economy can produce so much, so efficiently, the fruits of modern life (e.g., iPhones, air travel, clean water, abundant food) are available to virtually everyone. I reflected on this while visiting some centuries-old castles and estates today, where it took an army of servants to provide a standard of living for the wealthiest of landowners that would be considered below-poverty-level today. No electric light bulbs. No refrigerators. No HVAC. No TV. You get the picture. The daily life of a billionaire today is not all that much different from that of a median-income wage earner. Both have ready access to great food, a clean abode, cheap travel, cheap entertainment, great health care, and instant communications with just about anyone, anywhere in the world. The best news of all is that federal government spending has experienced very little or no growth for the past six years (see red line in the chart above)! 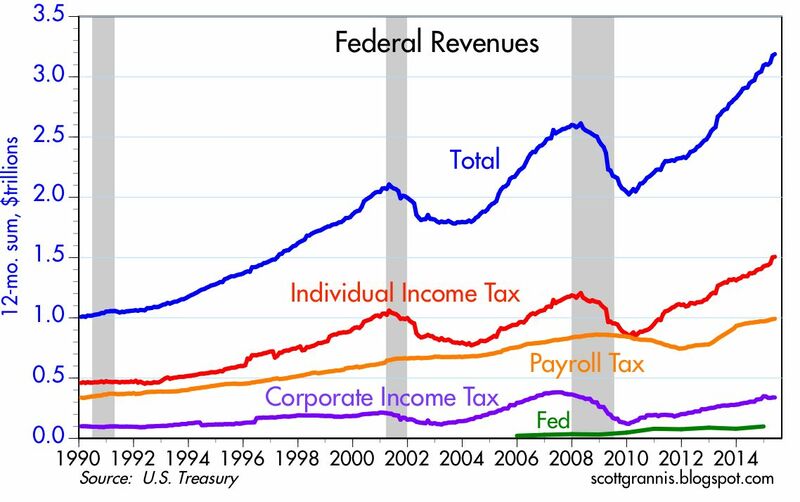 This has allowed the magnitude of government influence on the economy (mostly via transfer payments (aka income redistribution), which account for almost three fourths of federal expenditures) to shrink from over 24% of GDP to now just over 20%. As Milton Friedman taught us, government spending is equivalent to taxation, regardless of how it is financed. And when the amount of income that gets redistributed by the government shrinks by some 20% in just six years, that is significant. This is already giving the private sector a lot more breathing room, at the same time as it has reduced the expected future burden of taxation. This is the kind of stuff that can juice the private sector's animal spirits. 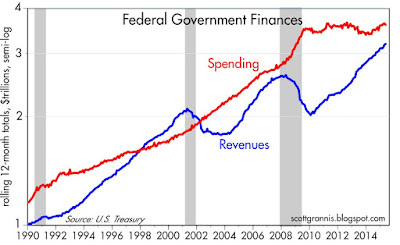 Thanks to zero growth in spending opposite relatively strong growth in revenues, the federal budget deficit is now approaching 2% by my calculations (see chart above). Six years ago we were staring at budget deficits that would equal or exceed 10% of GDP for the foreseeable future. As usual, it turned out to be difficult to foresee what has actually happened. This dramatic improvement—even though the economy has struggled to grow—is a big reason the equity market has been able to advance as it has. This is also something I've been blogging about since late 2008: markets have rallied because the future has turned out to be much less dire than expected. Just think what might happen going forward if our government managed to do just a few things right. 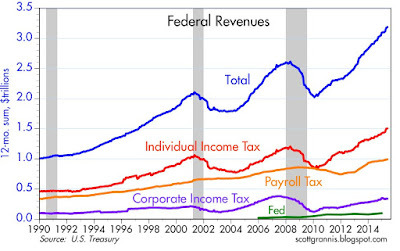 Like slashing corporate tax rates—which, as the chart below shows, are a very small part of total revenues but currently pose a huge barrier to investment (think of the billions in foreign profits that U.S. corporations refuse to repatriate—living proof that the tax code is distorting the economy). Or reforming entitlement programs—like privatizing social security and raising the retirement age. Or cutting capital gains rates, which, at 30% or so, penalize savings and investment. I'm an optimist because there are so many things that are wrong with our economy today that could be fixed easily and quickly. We've made significant progress in these past years by gradually starving the government beast, but much more needs to be done. Government simply can't spend $3.6 trillion a year as efficiently as the private sector could. Trying to spend $300 billion a month leads to too much waste, corruption, and inefficiency. To paraphrase one of Obama's advisors, the federal government is simply too vast to be run efficiently. 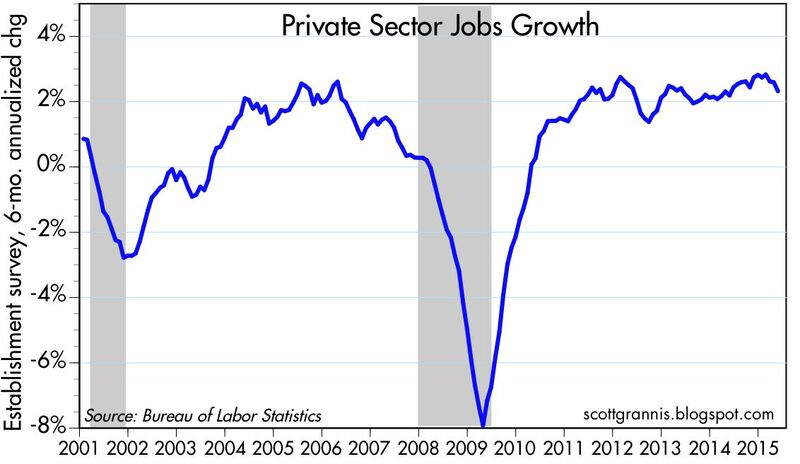 May jobs growth beat expectations, but that doesn't change the big picture. The economy is still expanding, albeit at a modest pace, and remains well below its potential. It's a slow-growth world we live in, but conditions are nevertheless improving at a rather steady if unremarkable pace. 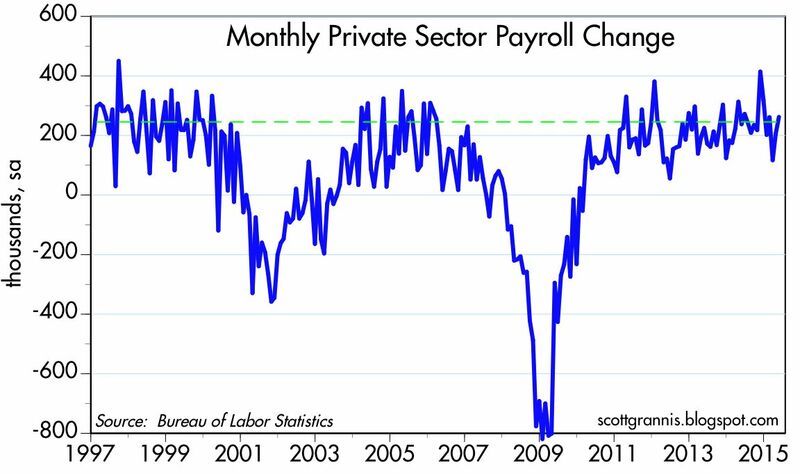 Focusing on the private sector's job creation (because that's the only thing that really counts), we see that jobs have grown on average by about 230K per month for the past six months. 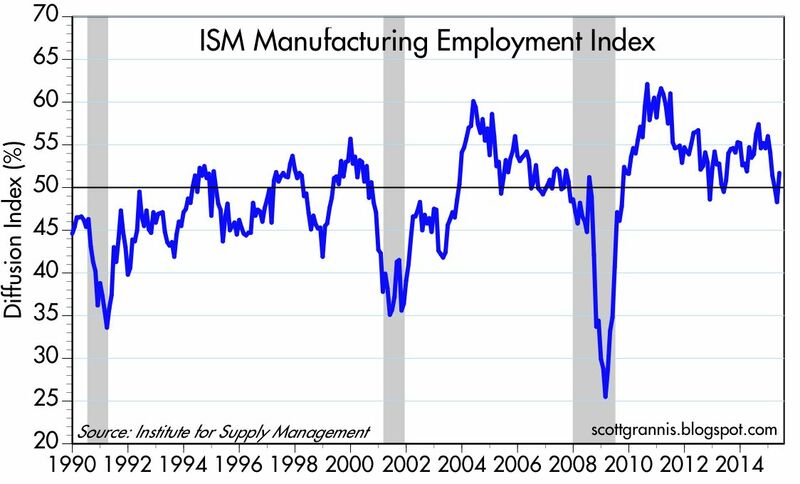 That's about the same pace we saw during the best years of the previous business cycle expansion. 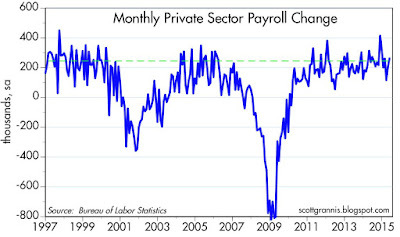 On a percentage basis, private sector jobs are up at a 2.3% annualized pace over the past six months. Nothing to get very excited about, but nothing to scorn either. 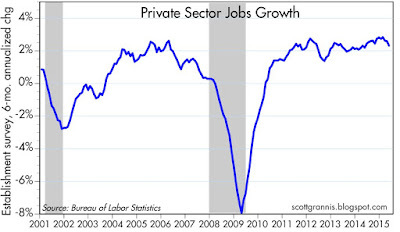 Over the past year, private sector jobs have increased by 2.5%. 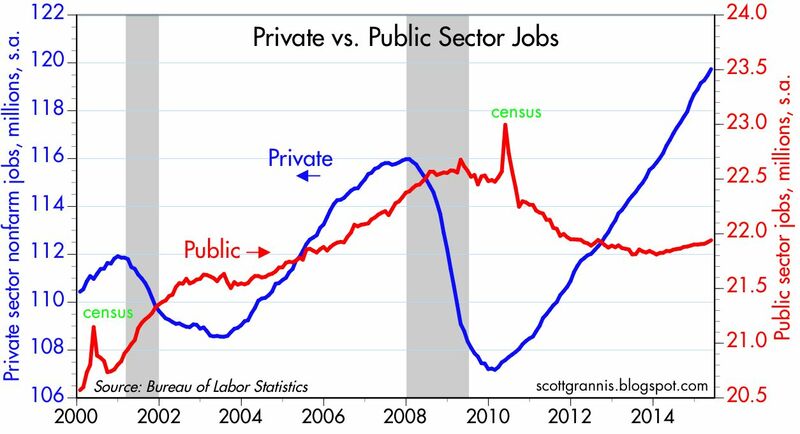 It's not widely appreciated, but as the chart above shows, public sector jobs growth has been very weak throughout the current expansion. 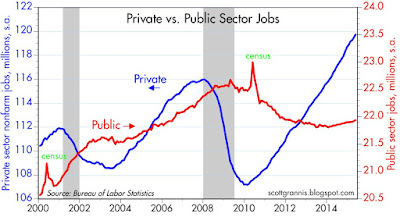 That's very encouraging, because it means the public sector is giving some extra breathing room to the private sector. Nothing in this report compels the Fed to tighten, but nothing prevents it from raising rates modestly it is so chooses. 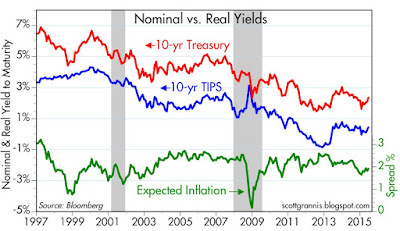 Even a 100 bps point rate hike would leave monetary policy in a relatively accommodative and non-threatening position. Nothing to get worked up about here, time to get back to cruisin'. I'm on a cruise ship somewhere between Capri and Messina, and the satellite internet speeds are so slow I'm reminded of the days when I used telephone modems. So I can't do much more than update some charts. They all show that nothing much has changed: the economy is still plodding along rather unimpressively, and the demand for the safety of money and its substitutes is declining slowly. Nothing scary and nothing very exciting. A good time to take a cruise! The ISM May manufacturing index bounced a little, soothing the fears of those who worried the economy was slipping into a recession after a weaker-than-expected first quarter GDP report. 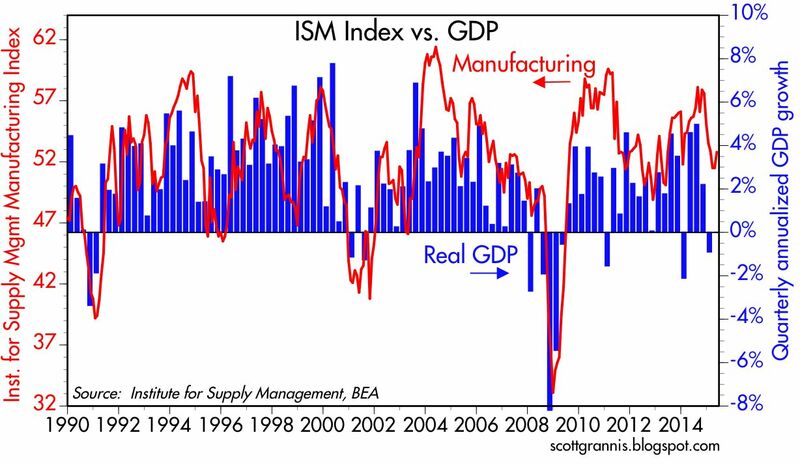 As the chart above shows, the ISM index is consistent with GDP growth of at least 2% in the current quarter, and it wouldn't be surprising to see it come in a bit stronger than that. 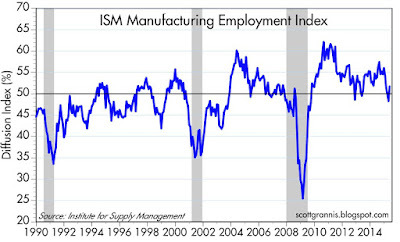 The April employment subindex was a bit worrisome, but the May reading reinforced the notion that we have seen the worst of the weakness that affect a lot of things in the first quarter. 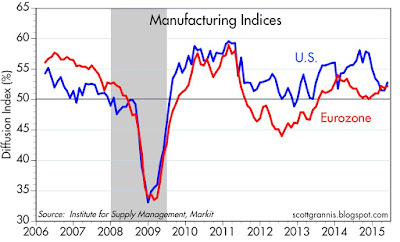 Both the U.S. and the Eurozone manufacturing indices point in the same direction: slow and unimpressive growth. 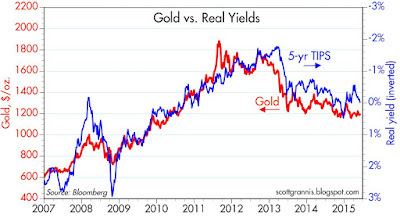 Gold prices are bouncing around their post-peak lows, and look to be drifting slowly lower. 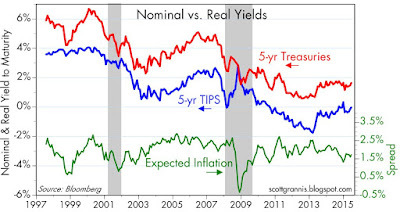 Real yields on TIPS—shown above in inverted fashion in order to proxy the behavior of TIPS prices—look like they are drifting slowly higher too (i.e., prices are drifting slowly lower). Both suggest that the world is less worried on the margin. This reflects a very gradual decline in the demand for money, and that, in turn, ratifies the Fed's intention to slowly raise interest rates from their zero bound.